Christmas wouldn't be Christmas without watching 'A Christmas Story'. In recent years TBS has been airing it as a 24 hour marathon that starts Christmas Eve night. In our family we have a tendency to watch it in snatches. While channel surfing someone comes across it and stops. We all help the characters recite their lines and then we laugh. Eventually we do sit down and watch it from start to finish. Such a fun tradition! I can hardly believe this but 2013 marks the movie's 30th anniversary. It's Christmas time and there's only one thing on Ralphie Parker's Christmas list this year: a Red Ryder Carbine Action 200-Shot, Range Model Air Rifle, but many obstacles stand in the way of his dream because every adult that he confronts keeps telling him he'll shoot his eye out. 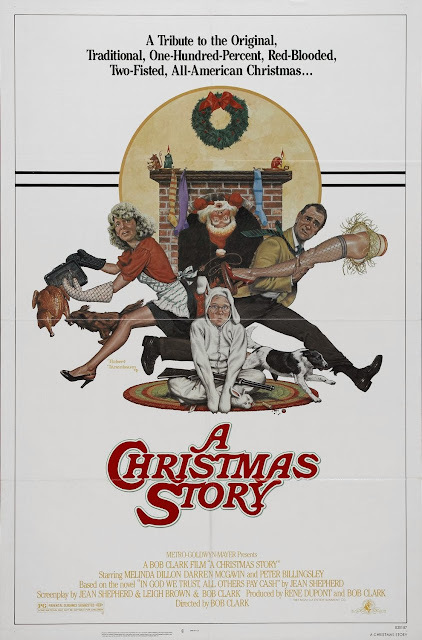 Meanwhile The Old Man just got a major award (a lamp shaped like a woman's leg), and Mom is making sure The Old Man doesn't come near her turkey, Ralphie's friend gets his tongue stuck to a flag pole, and Ralphie utters the f-word infront of his father. Christmas is drawing nearer and Ralphie visits Santa at the department store in hopes of asking him for his dream gift. Will he receive it? Let's hope so. Starting tonight at 8p/7c on TBS (24 hr marathon).